Heeft u een vraag voor Ara Hotel Gading Serpong? Voor reizigers die voor de bezienswaardigheden van Tangerang komen, is Ara Hotel Gading Serpong een perfecte keuze. De accommodatie ligt 4 km van het stadscentrum en de belangrijkste voorzieningen zijn dus goed bereikbaar. 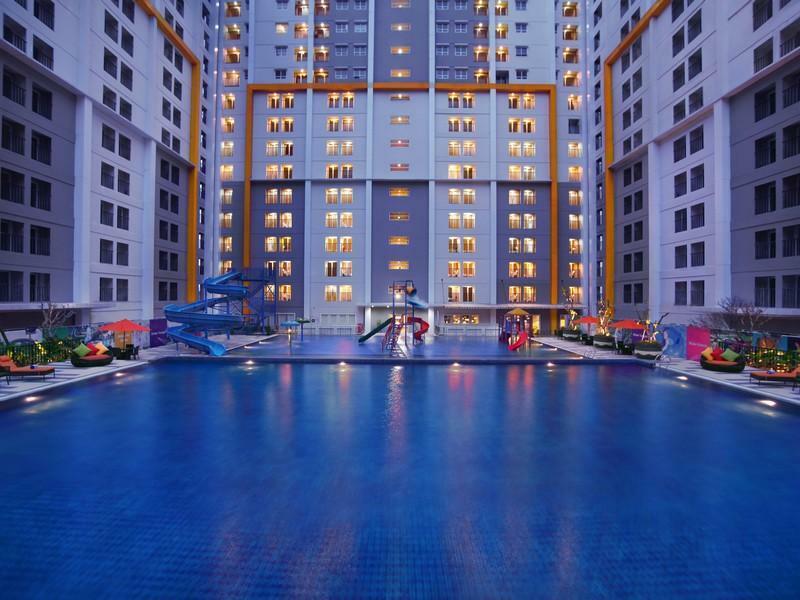 Deze accommodatie ligt in de nabijheid van populaire stadsattracties zoals Summarecon Mal Serpong, Bethsaida Hospitals, Scientia Square Park (SQP). Ara Hotel Gading Serpong biedt een onberispelijke service en alle essentiële voorzieningen om vermoeide reizigers een verkwikkend verblijf te bieden. Terwijl u in deze geweldige accommodatie verblijft, kunt u genieten van 24-uur roomservice, gratis wi-fi in alle kamers, 24-uur beveiliging, dagelijkse schoonmaak, 24-uur receptie. Stap binnen in één van de 136 uitnodigende kamers en ontvlucht de dagelijkse stress met een breed scala aan voorzieningen, zoals plasma tv, draadloos internet (gratis), rookvrije kamers, airconditioning, wekservice. De accommodatie biedt een uitstekende variëteit aan recreatieve voorzieningen, inclusief golfbaan (binnen 3 km) , zwembad (buiten), wellnessfaciliteiten, massage, zwembad (voor kinderen). Ara Hotel Gading Serpong is een slimme keuze voor mensen die naar Tangerang reizen, een ontspannen verblijf is gegarandeerd. Good hotel at a strategic location plus spacious parking lot.. 2 min walking to the restaurants (Japanese food) and pharmacies 5 min slow walking to the nearest mall (Summarecon Mall Serpong) There are a lot of restaurants and convenience stores nearby as well. Spacious room for 2 persons, complete amenities but they only provide single set. If you need another set just ask. Towel, soap & shampoo in one, hairdryer, hanger, and safety box are provided. Everything is all good, but for the breakfast, it's not tasty and less variation. The elevator was very slowwwwww.. It really took a long time. permintaan seusai, fasilitas, kebersihan juaraaa!!! breakfast enak dan banyak pilihan; omelette must try! someday i’ll back to stay again. we loved our stay very much. The room is spacious enough & clean. The staff are very helpful & efficient. the kettle in our room was leaking so we asked for a kettle replacement, they gave it to us in 15mins. I was impressed considering the hotel condition is full booked at Idul Fitri time. The breakfast spread was excellent, there was a lot of variety to choose from. There's something for everyone to eat. The pool is great, it was big, lots of space for everyone. pool towels available at request. We will definitely be back. The main attraction of this hotel is the pool. It's huge and has enough slides to keep the young ones entertained for hours. Though conveniently located next Summarecon Mall and many food stores, the surrounding area does not have proper pedestrian walkway. I would still recommend travelling by car or taxi. Breakfast has good variety of foods. Staffs are friendly and polite. The entire premises are clean. Wifi is free. Am complaining the house keeping. I found the animal dirth spread on the floor. Also the bed sheet pretty dirth. I asked to change the room on the next day,after lots of people bothering about my status (even though i paid the next day already) ((( they should crosscheck to the others receptionis before calling me so many times))) they finally granted and give me the different room arround 2 something pm. The DM was super kind and remember me as a guest the few months ago,thank you mr.Mario for quick and smooth check-in this time also for welcoming me back . Goodluck !!! Not bad, it was my third time here although the last time they gave me wrong bed size, i was asking for a queen bed instead of twin bed. My children very happy stay here because of the fantastic mini waterpark, although they expecting some indoor playground/kids zone. Me and husband love stay here because the location are near everything, mall, resto, atm bank, apothecary, etc. Staff are very friendly and responsive, hotel very clean. We would love to go back. We stayed only for a night here since we had a small family reunion in Serpong. The hotel's location is good, very near to Summarecon Mall Serpong. The hotel itself was quite clean although we found dust under the bed. The facilities were good for that price. You can find swimming pool and good breakfast varieties. The only downside is we only got the twin bed, because the large bed is fully occupied. Overall, this is a very recommended hotel to stay. This was the official hotel of Asia's largest varsity level British-Parliamentary debating championships. The hotel hosted the entire tournament with 114 rooms with 13 rooms booked through Agoda. It was a lovely venue with good facilities from swimming pool to function/conference rooms at an affordable price. In fact, the preferential rate given by the hotel is actually Agoda's rate as well. So the price listed here is very very reasonable. They can afford to improve a little on staff communications because some were very very helpful but had contradicting statements with other staffs so we were left confused at times. Definitely recommend this place for group events. Near mall, nice staff, good breakfast, nice swimming pool.. only one that tickles me, the parking regulation kinda confusing because we have to add some money when we get out from the parking area (when we checked in we already registered our car in the receptionist) same things happened with my friends who also stay at the hotel. The location was not as good as Atria but still consider good in terms of distance to the mall. The breakfast did provide many choices of food but the taste was just ok. The bed was not that comfy but room was pretty clean. Overall stay was pretty good considering the price you paid. But I Disappointed with agoda price, agoda price for ara 1 night 47,15 (excluded breakfast).Price @hotel by direct book.was 44,18(included breakfast),why agoda price more expensive rather than book.directly @ara hotel , this is some kind tricky bussines, so somebody book via agoda should becarefull!!!! The room cleanlines is satisfactory, the breakfast variety and taste was above the average, only the room a bit small. The mall is close so it made us easy to find other restaurants. In general, our stay was fine. 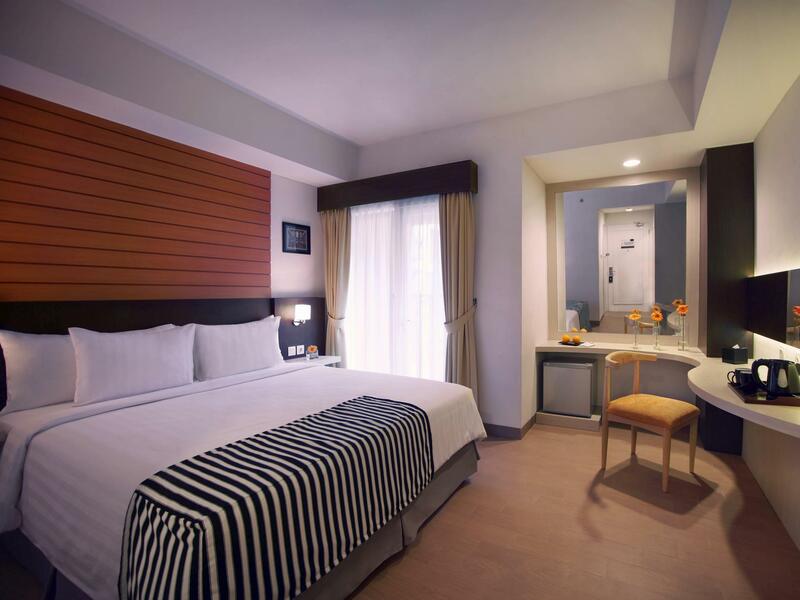 This hotel has good location in Serpong location and close to the big mosque. Next to big shopping mall and not far from airport. Food is excellent especially during BBQ Nite. The fish is very fresh. Swimming pools with water park will be good water playing zone for children.Recommended for staying for business or leisure.